Italian painter and architect. Vasari stated that he was first apprenticed to Luca Signorelli, probably when the latter went to Urbino in 1494. From c. 1498 until 1501 he was active in Pietro Perugino s workshop, where he probably met Raphael. 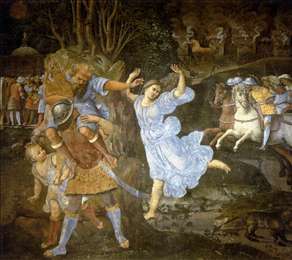 He later went to Florence, remaining there for some years, according to Vasari, before going to Siena, though the sequence of his movements between 1501 and c. 1513 is disputed. His career is unlikely to have followed the neat progression implied by Vasari, and it is more reasonable to consider the artist as relatively mobile, moving between different artistic centres. See more details about "Flight of Aeneas from Troy"